When exotic pet-sitter Belinda Blake moves into a carriage house in tony Greenwich, Connecticut, she’s hoping to find some new clients. Instead she discovers a corpse in the garden—and a knack for solving murders . . .
Pet-sitter Belinda Blake doesn’t rattle easily, but move-in day has been eventful, to say the least. 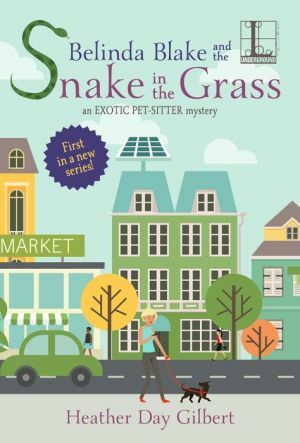 The python in her care tried to slither to freedom—just as she met Stone Carrington V, her landlords’ disarmingly handsome son. With the constrictor back in its cage, she heads out to the garden, only to discover a designer shoe poking out of the boxwood hedge—attached to a woman’s dead body. The victim, Margo Fenton, was a Carrington family friend, and no one in their circle seems above suspicion. Between client trips to Manhattan and visits to her family in upstate New York, Belinda begins to put the pieces together. But though she’s falling for Stone’s numerous charms, Belinda wonders if she’s cozying up to a killer. And soon, daily contact with a deadly reptile might be the least dangerous part of her life . . .